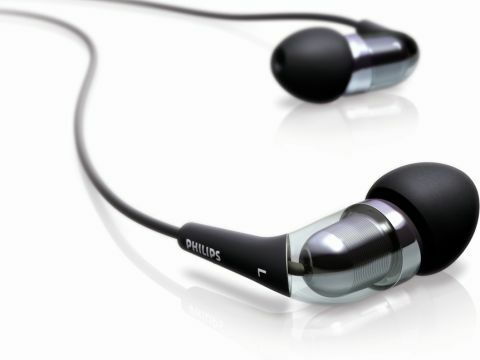 The single-driver Philips SHE9850 earphones definitely offer impressive audio performance considering the price. Previous pairs of earphones from Philips have failed to live up to the standards set by the likes of Shure and Denon. So we were rather pleased to discover that a corner has been turned in that respect. The question is: has Philips improved enough to match or surpass similarly priced products from its rivals? It's hard to say. Because while the SHE9850's deliver a lot in many respects, they under-perform in others. They certainly don't fail to impress when you first open the box. An extremely robust design means the earphones both look and feel very solid. A brush-metal carry case is also provided, which makes a refreshing change to the zip cases usually found with Shure's products. You can pick these up online now for around £65 which is pretty cheap. So as far as audio performance goes, we weren't expecting anything particularly special from them – and we weren't treated to anything terribly special either. But what we did get was very solid all-round audio which sounds acceptable at all ends of the spectrum. If you want to be critical, you'd have to say that the highs and lows are both pushed very much into the midrange. Which, when compared against a dual-driver set from Shure, makes the Philips SHE9850's sound very pedestrian indeed. We use various Pink Floyd tracks as a benchmark and found that bass guitar, along with cymbals and acoustic guitar are all muddied noticeably. But when compared against a similar single-driver product from Shure, there really wasn't much difference at all. And what that boils down to is that to beat the Philips SHE9850's on performance, you would need to spend over £100 – you'd almost have to double your spend. They're a bit of a bargain then – for the price you get a lot. And that's because they're aimed at people who're fed up with the dreadful earbuds provided with iPods and other MP3 players. They're a massive step up in that respect. But beware, if you consider yourself to be somewhat of an audiophile, you're likely to find these earphones unacceptable.